While in Mexico working with the Chef Paola Garduño at one of her restaurants I learned a technique from his innovation Chef “Beto”, whom in turn learned it while his staging at World’s best restaurant Noma, with Chef René Redzepi. It is similar to what you do when pickling. What salt does is preventing the grow of bad bacteria and yeast and allowing lactic acid bacteria to do their job. 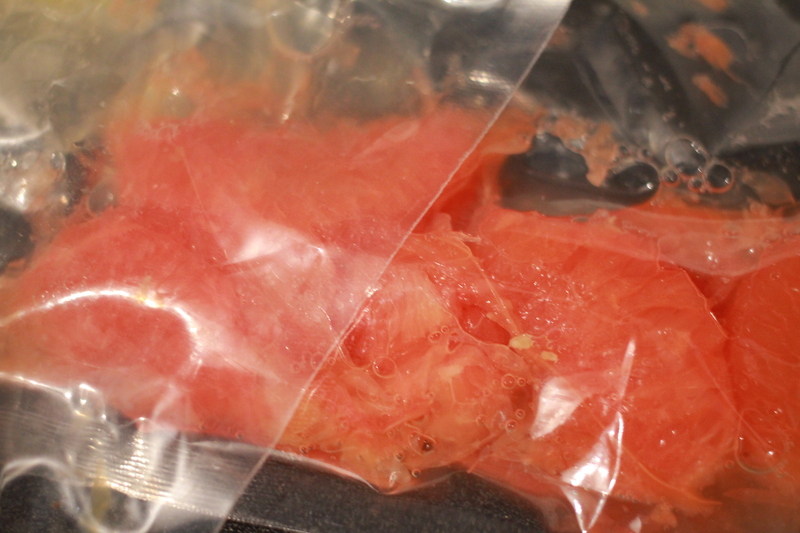 The technique is surprisingly easy to apply: weight your ingredients to be fermented, add 2% of its weight in salt, vacuum seal it and let it rest fro 12 to 24 hours. (However, I recommend you listening to THIS podcast and read about some preventions to consider in order to make it safe. For example it may be safer to leave a little bit of air inside the bag as opposite to a 100% vacuum). Open the bag and taste. you can either strain it and use just the juice in an atomizer as I did, or use the fruit a well. The result is a savory fruit juice and fruit matter that is slightly acidic and salty, but why I found more interesting was how the aromas increased. 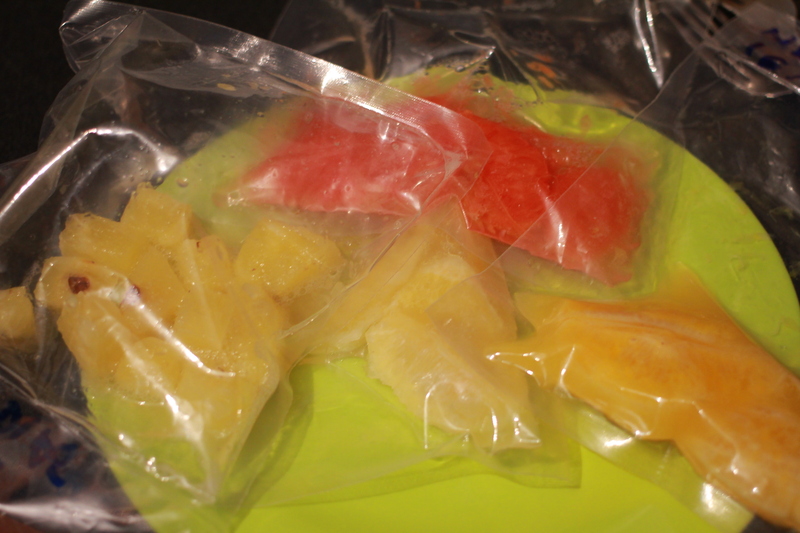 You need to experiment with different ingredients, for example pineapple didn’t result in a very pleasant aroma or flavor. My favorite was raspberry. The resulting fruit itself was a little sour as well as the juice (after fermenting for 24 hours, maybe less fermenting time will result in a different flavor profile) but the aroma was stronger than non lacto fermented raspberries and very pleasant. I thought it could be used as a good addition as part for home made grenadine syrup or as part of a raspberry syrup. In the meantime I have used it with an atomizer to aromatize drinks with nice results. I have also tried with Grapefruit, orange and lemon. Lemon was discarded, it was nasty! 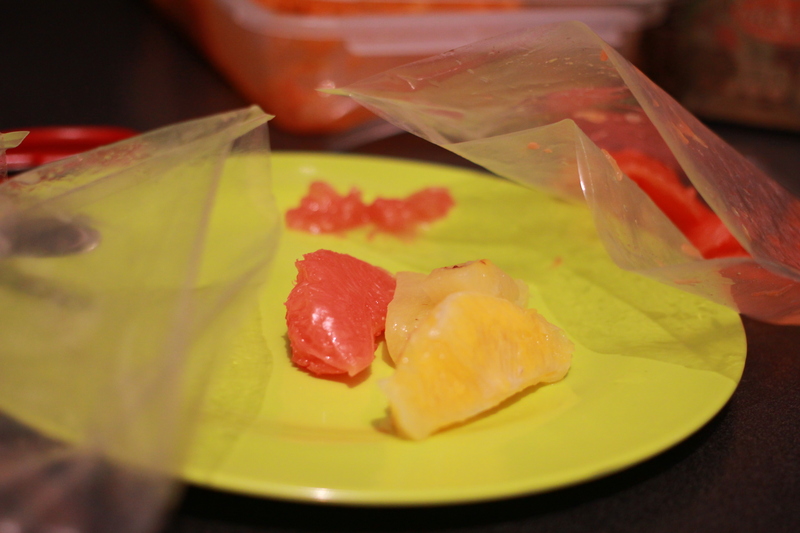 But orange and grapefruit resulted in very interesting flavor profiles worth experimenting with. Let me know if you experiment with this technique and discover nice ways to apply it. This entry was posted in Bar management, Various and tagged aroma, citrus, cocktail, fermentation, flavor, ideas, ingredient, lacto, noma, raspberry, recipe, rene, smell, taste, vacuum. Bookmark the permalink.